I purchased a used YS1500 that was manufactured on 5/11/2015. I took a look at the online manual and there is no reference to the probe port. Online though, I'm reading that a probe port is included in a new YS1500. Is this a new feature? First question is, where is the factory probe port placement? I read that I was not supposed to put my thermometer cords the door (makes sense), but where else can i put them without the port? Eventually, i would love not to use thermometers, but while i'm starting out, i need them. Yes, the YS1500 has an included factory probe port, which is on the hopper side of the cooker. It's easy enough to drill a 5/8" hole and put a high temp gasket on it for ohh about $7. It's what I did on my YS640. 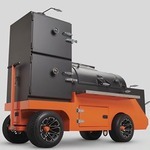 Yoder_Herb wrote: Yes, the YS1500 has an included factory probe port, which is on the hopper side of the cooker. That's what i thought, but this one doesn't have it. weird..